In 2017, Emily Morrow Home founded the Kiker Morrow Finkell Foundation for Cancer Care which offers help to families and individuals who have received a cancer diagnosis and serves to be the “heart” of the Emily Morrow Home brand. As a breast cancer survivor herself, Emily utilizes a portion of proceeds from her business to support the foundation as a means to honor and “pay back” those who helped her and her family during her own battle. Emily Morrow Home began with a love story—a life-long love for design that grew into a profession. 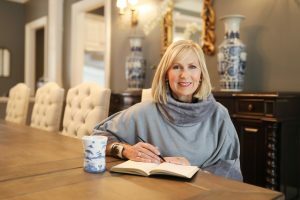 After almost 30 years of practicing interior design, Emily has embarked on a new journey in life. Welcome to her new enterprise, Emily Morrow Home, a collection of home décor products inspired by Emily’s life, loves and worldly adventures. 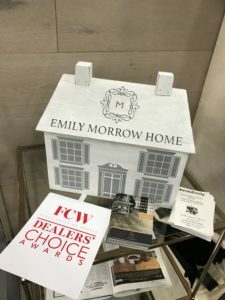 The Emily Morrow Home Collection is not only about making our lives and homes more beautiful, it’s also about making the process of designing the home easier while avoiding the usual pitfalls. That is why Emily Morrow sells through professionals, people with proven ability and craftsmanship who stand behind their work. Emily Morrow hopes these collections will inspire you. And for even more inspiration, and a deeper look into Morrow’s craft, watch her short coastal luxe or safari travel-inspired videos and visit her blog, The Ultimate Guide to Living a Beautiful Life, where you’ll find useful ideas and insights into home interior design. 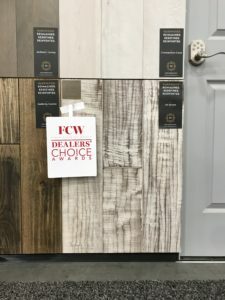 This year, Emily Morrow Home Hardwood was nominated in two categories for the Floor Covering Weekly Dealers Choice Awards, for “Jet Stream” a beautiful walnut engineered hardwood style as well as the Emily Morrow Home Designer Sample House, for its unique design and sample efficiency. Every detail connotes “home” from the shape of the sample house to the white washed, sanded-down matte finish, utilizing the same sliced white oak that helps to make her products so luxurious. 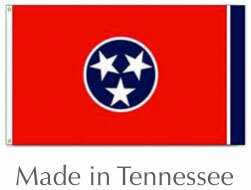 These premium, American-made hardwood flooring styles are designed to be unique and offer the highest level of quality available. 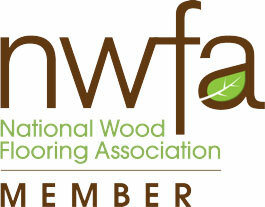 Lifetime structural warranty* on the construction of the product and wear through the top layer of wood. 25-year finish warranty. The Ultra Violet Cured Aluminum Oxide Enhanced Finish cannot be duplicated on the job site and gives superior abrasion resistance. Engineered with a premium .65” thickness, which gives a firmer feel underfoot when installed over a floor joist system. No bounce. An eye popping 7” wide and up to 8 feet long, 75 percent fewer seams than traditional floors. Perfect for open space floor plans. All-American hardwood construction for superior durability and stability so they are more dent resistant and can be installed over most sub-floors including direct glue down to concrete slabs. 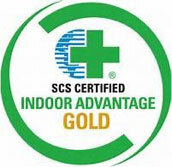 Manufactured with low VOC finishes and adhesives that qualify as CARB II Exempt and SCS Indoor Advantage Gold to protect your family’s health. 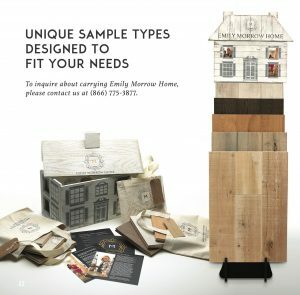 One of the category nominees, the Emily Morrow Home Designer Sample House. “Jet Stream” is one of the many beautiful hardwood styles within the Emily Morrow Home hardwood offering. 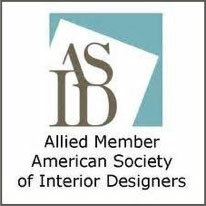 It was among the nominees of Floor Covering Weekly’s Dealers Choice Awards at Surfaces 2018.